The Dalai Lama as photographed by Victor Mansfield. Vic himself in 2006. When the Dalai Lama visited Colgate University in April 2008, my husband Vic Mansfield’s main source of calories was Ricola cough drops. Prednisone no longer suppressed the swelling and coughing of the incurable lymphoma he’d struggled with for two years, but nothing worked better. Each morning, this previously healthy and fit man had a hangover from the Ambien and codeine he took the night before to get a few hours rest. After forcing down a spoonful of oatmeal, he took prednisone with a pot of coffee. Somehow he stayed on his feet, motivated by his desire to see the Dalai Lama one last time. We first met the Dalai Lama in 1979 during His Holiness’s first visit to the United States. Hosted by our meditation center Wisdom’s Goldenrod, the Dalai Lama spent four days in the Finger Lakes area of New York, meeting with group members and our children and dedicating our new philosophic library. Goldenrod members drove him to speak at local universities and meet with Iroquois Indian leaders in northern New York. He visited our Center again in the 1990s and many of us traveled to attend his teachings in India, the United States, and Canada. In 2005, Vic and another faculty member recommended that Colgate University invite the Dalai Lama to speak at the annual Global Leaders Lecture Series. Vic was a physics and astronomy professor who taught a popular course called “Tibet” for over twenty years. The lecture and a two-day campus visit were tentatively scheduled for the spring of 2009. In early 2006, Vic developed persistent flu-like symptoms. That spring, the Dalai Lama’s office asked Vic to write a book about Buddhism and Physics. They hoped Vic’s book would help young Tibetans realize that a scientist could also be interested in the spiritual quest, since Chinese education taught them otherwise. Vic had never taken formal Buddhist initiations, but his class on Tibet was loved by his students, he had published many articles on Buddhism and physics, and he was deeply devoted to the Dalai Lama. When Vic’s lingering illness was diagnosed as incurable lymphoma, the drugs and disease made it nearly impossible for him to meditate. So after forty years of focused sitting meditation, Vic’s primary spiritual practice became the Path of Kindness. He maintained gentle civility and gratitude when he was taxed to the limit by exhaustion and the psychological and physical effects of drugs used to control intense swelling. Instead of becoming sullen and argumentative as most people do on steroids, Vic took it as his spiritual responsibility to follow the Dalai Lama’s core advice. Kindness became his priority. He was a favorite of doctors, nurses, aides, and custodians at the hospital. He beamed love at everyone, especially me. Vic’s devotion to the Dalai Lama grew even stronger. So did mine. 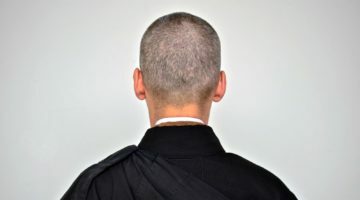 After a first round of chemotherapy and a stem cell transplant in early 2007, Vic felt well for about six months and finished the book Tibetan Buddhism and Modern Physics: Toward a Union of Love and Knowledge. His Holiness wrote a glowing introduction. That spring, the Office of Tibet asked if Colgate would host the Dalai Lama in April 2008 instead of 2009. The proposed date was just two and a half months away, but some brave soul said yes. Templeton Press would publish Vic’s new book in March 2008, so we knew if Vic were still alive, he could present his book to the Dalai Lama in person on April 23. My goal was to keep Vic glued together until that day. On April 22, the first day of the Dalai Lama’s visit, Vic was swollen and exhausted, but excited like a schoolboy. He beamed when he returned from the opening luncheon where he was seated directly across from the Big Guy. He beamed throughout the afternoon public lecture, squeezing my hand with happiness and reaching out to caress our adult son’s shoulders. After a newspaper interview in the afternoon, he was spent. David and Anthony and I helped him to our hotel room and prepared a plate of food brought from home. Vic ate a few bites. His body convulsed with coughing all night as it had for months. Neither of us slept. In the morning, Vic rallied. We were the first two people in the eighty-seat lecture hall where the Buddhism and Science Colloquium would take place. I made sure Vic had enough cough drops and water. I slipped him an extra codeine pill timed to take effect at 10 a.m. when the discussion began, drew a diagram on the blackboard that Vic needed for his talk, and saved seats for David and Anthony. I paced. Finally, I sat down and surrendered to exhaustion and relief. Despite all odds, Vic was here for this day. Colgate’s president held back emotion as she welcomed His Holiness and introduced the panel. Then, she nodded to Vic who left his chair and walked toward the Dalai Lama as he held out a silk-wrapped copy of his book. Vic bowed deeply. The Dalai Lama stepped off the podium, moved close to Vic, and peered intently into his eyes as he took the book. Vic’s voice broke with tears as he thanked His Holiness for the spiritual, political, and intellectual inspiration he had given Vic, his students, and the world. The Dalai Lama grasped the book in his left hand and opened his arms like a mother reaching out for a suffering child. He cupped the back of Vic’s head with his right hand and pulled Vic into his maroon-clad shoulder. Vic gasped and sobbed. Everyone in the room wept with him. “Well, we’ll see if I can recover from that,” Vic said with a sideward glance toward the audience and a shy smile. He wiped his tears with his shirtsleeve, slowly walked back to his seat, took a deep breath, popped a Ricola, and gave a 15-minute lecture on causality that everyone in the room, scientists and nonscientists, fully understood. He paused frequently to give the translator ample time and made sure the Dalai Lama understood what he was saying. He ended his talk with a question for His Holiness about the relationship between causality in quantum mechanics and causality in Tibetan Buddhism. I was achingly proud to be Vic’s wife, proud that he was here because of his will to complete his work, his good karma, and my unwavering care. Vic was a dying man, and after that hug, I sensed his death close by. I also knew that the Dalai Lama would help us through. Three other professors delivered talks from somewhere in the intellectual stratosphere. They spoke so rapidly that the Dalai Lama’s translator couldn’t keep up, so His Holiness sat cross-legged on his throne-sized chair and leafed through Vic’s book. When it was his turn to speak, the Dalai Lama made a few general remarks. Then he turned toward Vic and answered the question about causality in Buddhism, in detail. After that embrace, Vic no longer feared his coming death. 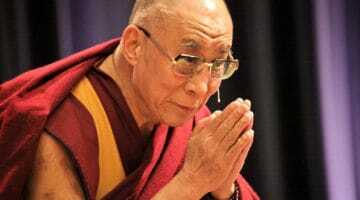 Sitting upright in his sick bed at home, he repeatedly watched the DVD of the Dalai Lama answering his question. Vic’s mind was dulled by drugs and the Dalai Lama’s explanation of causality in Tibetan Buddhism was subtle, but finally Vic got it. He kept watching the video anyway. 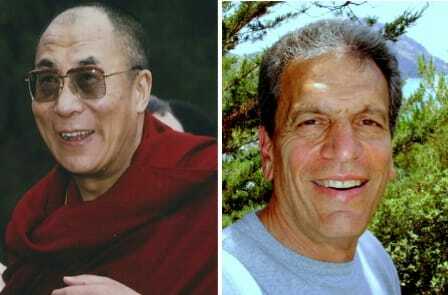 Colgate sent Vic the two photos shown above—one of Vic offering his book to the Dalai Lama and one of the embrace, two men cheek-to-cheek, their faces buried in each other’s shoulders. Vic carried the pictures back and forth between his desk and his bed and looked at them frequently. Less than six weeks after seeing His Holiness, as I ran out the door to drive my husband to the hospital for the last time, I grabbed the photo of the embrace. As Vic lay dying, the photo was taped on the wall of his hospital room so he could see it. It assured Vic that the Dalai Lama’s blessing was more than a dream. It was the sacred exclamation point to his life. Namgyal Monastery in Ithaca, NY began a yearly lecture called the Victor Mansfield Memorial Speaker Series after Vic’s death in 2008. This series hosts lectures and weekend workshops from Westerner scholars who study Tibetan Buddhism. As well as teaching physics at Colgate University, Vic Mansfield taught workshops throughout the United States and Europe on Buddhism and physics. Elaine Mansfield has focused on bereavement and hospice work since the death of her husband Vic Mansfield, author of Tibetan Buddhism and Modern Science: Toward a Union of Love and Knowledge. Her book Leaning into Love won the 2015 Gold Medal IPPY (Independent Publisher Book Awards) in the category Aging/Death & Dying. Elaine’s TEDx talk is called Good Grief! What I Learned from Loss. For more information, see her website or contact her on Facebook and on Twitter. Incredible story, inspiring and full of compassion! It makes me feel wonderful to read your comment. Thank you. Thanks, Shambhala Sun Space, for posting my article and including many nice photos. How beautiful, and what an honor to be able to thank you directly here. And I thank you for reading the post and for your affirming words. Incredible recount of an amazingly blessed experience. Thank you, Elaine. Thank you for sharing this beautiful story. The power of love, devotion and kindness shine through your husband's powerful example. Thanks you, Paula. The Dalai Lama brings out the best in us when we are most in need of strength and love. Thanks so much for your responses to this piece. Compassion pours off the Dalai Lama, and sometimes the rest of us catch a little drop in our begging bowls. It was a blessed day and a blessed life. Oh ((((Elaine))))… so touching. What a memory to treasure forever… Again you find the words to describe such an awe-inspiring moment to absolute perfection – just amazing… Such an experience. Ann, it's wonderful to read your message, to know that you are touched as I was by the experience. It is something to treasure forever and, for Vic, it was the top of Mount Everest. Thank you, for this moving article. It brought tears (the good kind!). Thank you, Christi. It still makes me cry, too, even though it happened more than five years ago. Thank you for sharing this part of your and your husband's life with us, Elaine. Even though I read it through tears, it felt like a message of hope and love. Like the universe truly does conspire to give us what we need. What a wonderful memory. Science and Buddhism are two of my favorite subjects so I've ordered your husband's book. I'm sure it will be as much of a blessing as your words are here. Thanks again. Yes, the Grand Plan arrived for Vic in his last months, even as he was obviously dying. You'll love his book if you love Buddhism and Science. The Dalai Lama asked Vic to write the book and His Holiness wrote an introduction for it. It was Vic's last gift to life, given with great will because of illness and even greater love. Elaine, as always when you write about your life with Vic, your writing captures the true essence of this extraordinary moment in time in a way that enables the reader to see and feel it through his or her own eyes and heart. It's as if your ego steps aside and simply allows your objective Observer to create the pictures and mood without drawing attention to yourself or being overly sentimental. This is an amazing, highly unusual talent. I hope publishers and editors will take notice of this when they read this remarkable piece. I can't wait to see your book in print. Thank you for sharing Vic's life and your soul this way. Written with beauty and understanding laced with loving kindness. You and Vic continue to pass forward your wisdom. 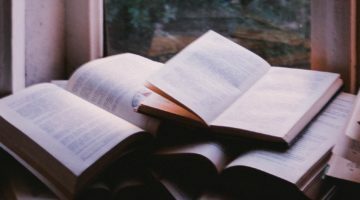 Vic's books help in bringing understanding to synchronicity and and causality Thank you for sharing. Elaine. No words. Okay, I will try. Beautiful. Vic met the height of fulfillment with you by his side. I keep thinking of the strength and courage that you gave him. He gave you, etc into infinity. As a former caregiver to my husband through leukemia, treatment, stem cell transplant, then Graft vs Host attack, I feel that I know the shape of your foot, as I have walked in your shoes. Mary Ann, I appreciate your kind words. As I create a new life, I often feel that I carry Vic along with me on my new adventures. In my dreams, he's often sitting in the passenger seat of my car, a terrific symbol for his place in the passenger seat of my psyche. His books made an important contribution to Tibetan Buddhism, Jungian thought, and physics. I'm grateful his ideas are still here even if his body is not. Thank you. Beautifully written, and so moving; thank you. Thank you for reading, responding, and encouraging. Much appreciated. thank you for this story of courage and openness in the face of a terrible illness. I learned how the greatest spiritual blessings can come at the worst of times. Thanks for your reflections, Gita. Thank you for taking time to read and respond to my article, Louis. Yes, it was a life of grace and then a life of loss. You likely agree that this is the way life is, if we're lucky and get the grace part. With gratitude. This is a thrilling and inspiring story. So many thanks to you, dear friend … and to Vic. Thanks for taking time to read and respond, Peggy. I'm glad you found this thrilling and inspiring. Of course, I did, too. I'm in a restaurant. I'm crying. Thank you, Elaine for sharing. Can't wait to read Vic's book. You make me cry, too, Gilana. Thanks for reading this piece. More of the Dalai Lama story is in my book 'Leaning Into Love: A Spiritual Journey through Grief' (Nov. 2014 release). Vic also has a website (I've kept it online, even though it looks old-fashioned, but there are good articles there.) It was quite a send off for Vic. Peace and gratitude.